We traced our steps to where we came from and studied the wooden map mounted somewhere. 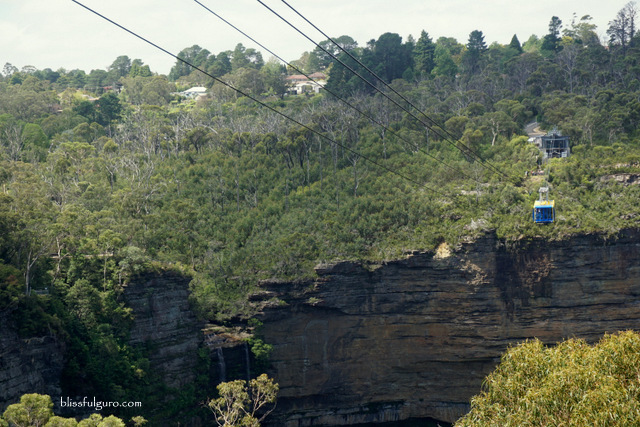 We were supposed to be on a viewpoint for the highest waterfalls of the UNESCO World Heritage Site of Blue Mountains, but we weren’t anywhere near it. We were literally lost in one of the best national parks in Australia and we were actually doing what we usually despise, hiking. 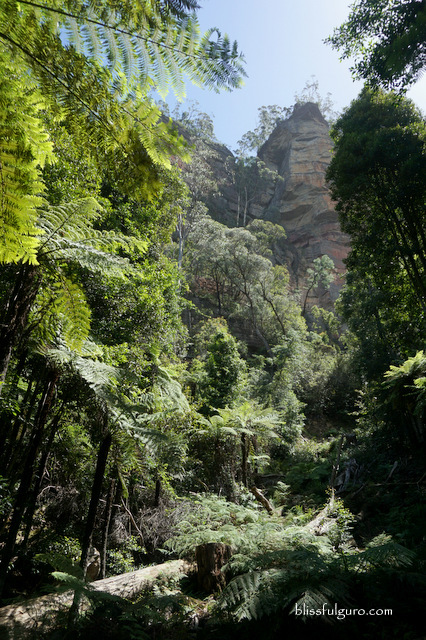 Bushwalking, as they call it, was never on our itinerary. But there we were, finding our way in the middle of the jungle amidst all the self-guided maps around, while my legs and feet were protesting on the very ‘appropriate’ harem pants and cheapo rubber sandals ensemble. It was during the wedding preparations of our laidback backyard wedding in Zambales when we realized that we needed a celebratory honeymoon trip afterwards. We initially planned on having a winter trip in Japan but after a sponsored deal on Manila to Sydney flight with Scoot, we considered a two-week Australian adventure—my very first trip outside Asia. 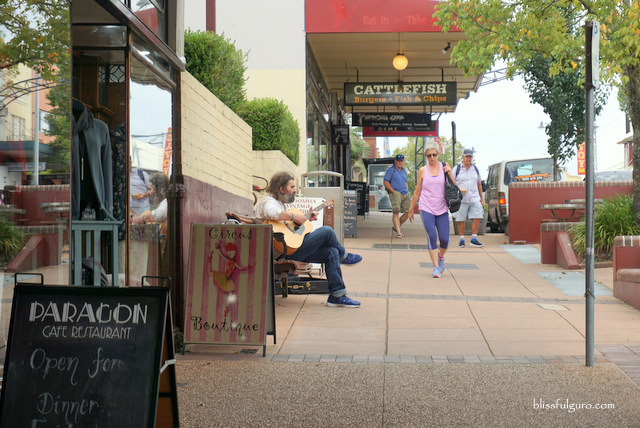 After consulting with One Vine Migration and getting an Australian Tourist Visa in the Philippines, we checked our options and decided to cover four key destinations—Sydney, Byron Bay, Gold Coast and Brisbane. With deals on tours, activities and transportation options from Klook, we surely would get the best price for our chosen adventures. Our Manila to Sydney flight via Scoot had a 16-hour layover in Singapore which we totally love as we got to submit ourselves on a full day food trip session. The 8-hour Singapore to Sydney flight onboard a Boeing 787 Dreamliner was an adventure in itself as we got to experience a comfy flight on a low-cost carrier. Amazing, right? 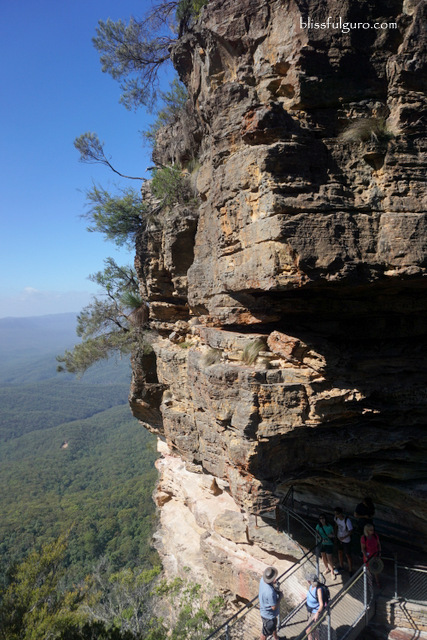 After settling in on our cheap accommodation in Sydney CBD, we prepped for our plan the next day, to conquer the UNESCO World Heritage Site of Blue Mountains—one of the best national parks in Australia. 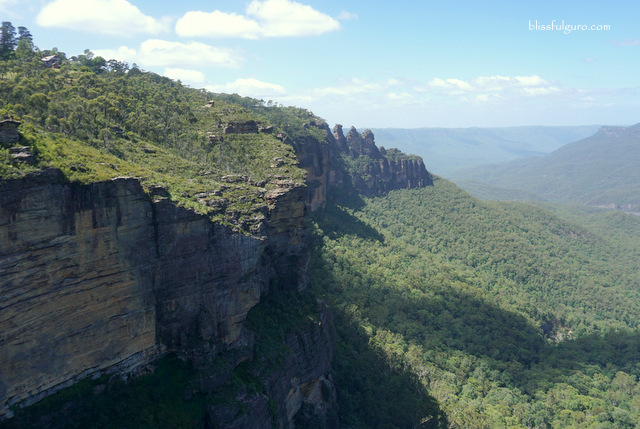 We scored a great deal on a Blue Mountains Unlimited Discovery Pass from Klook App. I was searching on my smartphone for possible tours on nearby towns in Sydney when I saw it. The offered price was cheaper than buying it on the location. The convenience of having a travel app at your fingertips is unparalleled, you should try this phone app whether or not you’re a frequent traveler (check here for discounted tours, transportation and activities in Sydney). 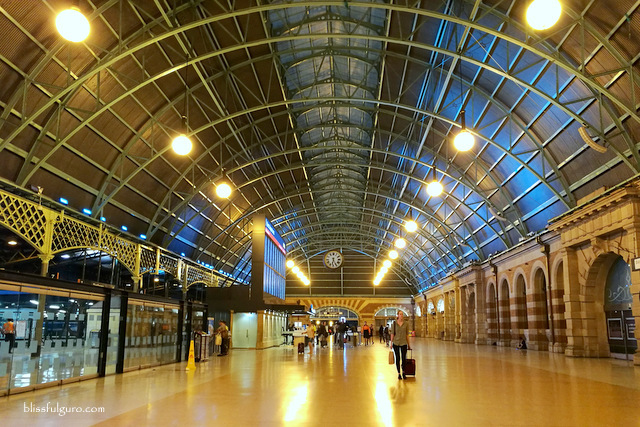 The Central Railway Station was our gateway from Sydney to Blue Mountains. 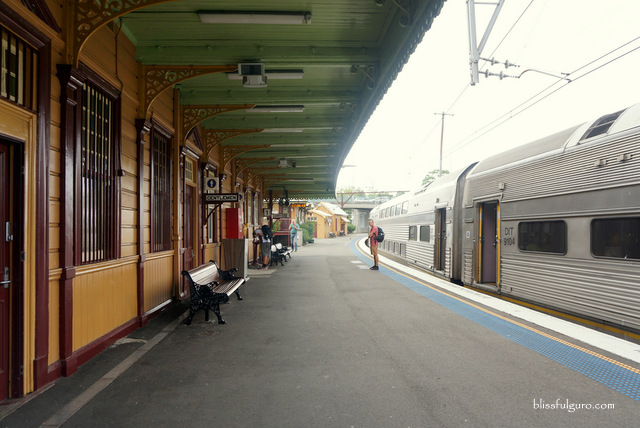 All we needed to do was to board the train that terminates in Katoomba. From there, we can take the public bus going to the national park. Easy peasy. It was around six in the morning when we left our hostel, good thing was that it was near the station so it only took us five minutes to get there. We were then told that the earliest train going to Katoomba just left a minute earlier, we needed to wait forty minutes for the next train. We didn’t mind the wait though as we love people-watching. 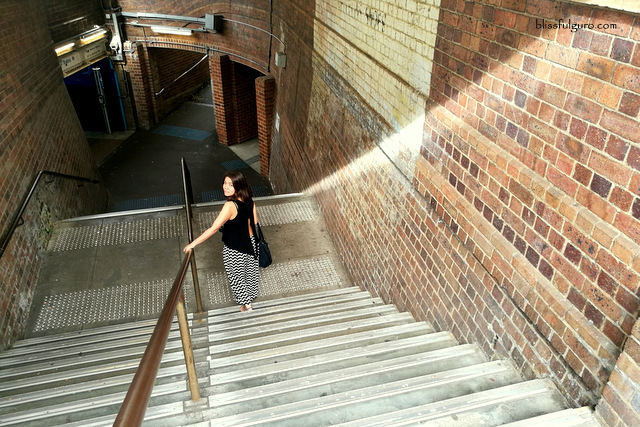 We stayed on our designated platform and observed Sydney’s morning rush. Amidst the chaotic haste, we were quietly seated on our bench. The first thirty minutes of the trip was lovely as we got to see Sydney suburbs. There’s this nostalgic feel to the scene outside, like an old romantic movie. Thick foliage enveloped the suburban houses and I could see the early morning scenes. I went into a deep slumber afterwards. I woke up to my buddy’s smooth tap on my arms. 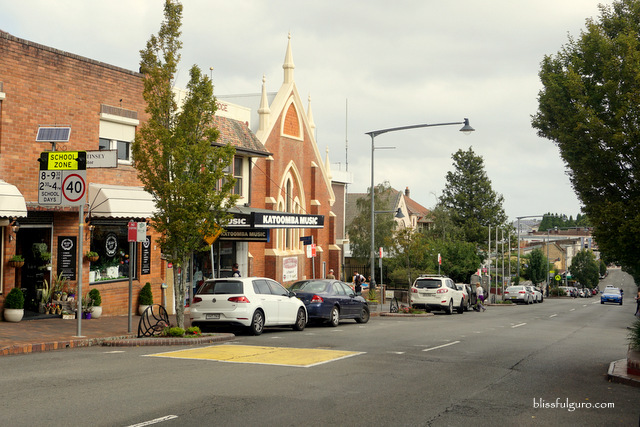 We were at Katoomba Train Station and we needed to halt, it was the last station. My mind was still in dreamland as we got off the train. With no idea on where the bus stop was, we asked a tour company on top of the exit stairway and asked for help. We received the warmest reception from the staff, which has been a common thing to Australians during our visit. The autumn air was cooler here than in Sydney. We waited on the bus stop but we soon realized that the bus will not be arriving until 30 minutes, so we decided to just walk to our first stop which is two kilometers from the bus stop. It was a leisurely walk up and down the hilly road. The chilly wind helped us to get through with the arduous saunter. It was weird though as it felt like we were in a movie set of a zombie movie as there were literally no people around. Maybe they’re busy on school or work but there was no one around. We reached our first stop, the Echo Point Lookout. 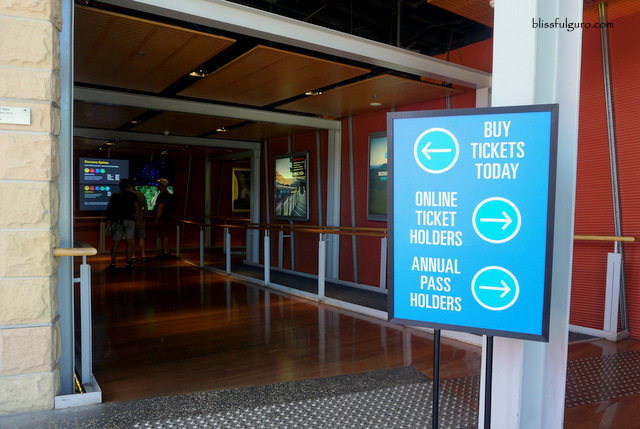 There were no entrance fees or whatsoever to get into the lookout. Flocked with morning tourists, we looked for a spot where we could see the extensive mountainous region. First thing I noticed was the three towering rock formations above Jamison Valley. 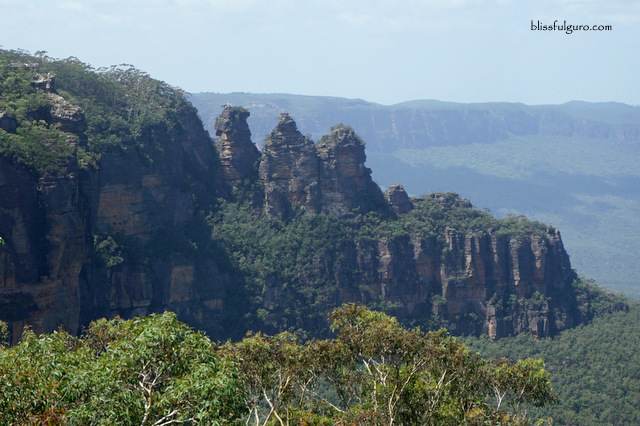 Apparently, it’s the ‘Three Sisters’ which were formed by land erosion. The exposed orange sections are actually due to recent erosion. So maybe in time, they will all be broken up. We followed a path that leads to these three giants. The 20-minute walk was easy on the first half while the next phase consisted of steep steel and stone steps. The view from one of the sisters was utterly amazing. 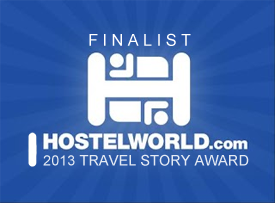 We stayed there for a bit and enjoyed our lone time there, the perks of a weekday trip. There were signages leading to some self-guided trails so instead of walking back to where we came from, we decided to check it out. We followed a path going to the highest waterfalls in Blue Mountains but we were kinda lost. 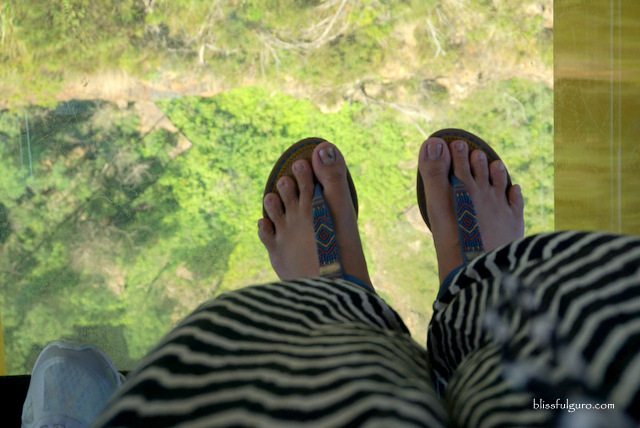 Hiking and trekking aren’t our thing and with my cheapo sandals and harlem pants, I wasn’t really prepared. We then realized that we’re actually engaging into bushwalking, very Aussie. 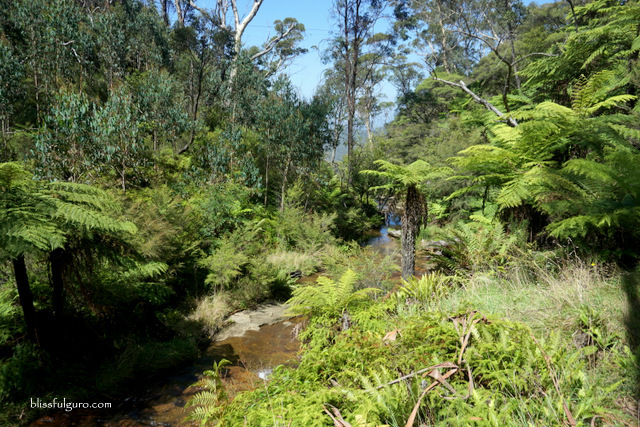 After an hour or so of leisurely hike, we reached our main agenda for that day—Scenic World. 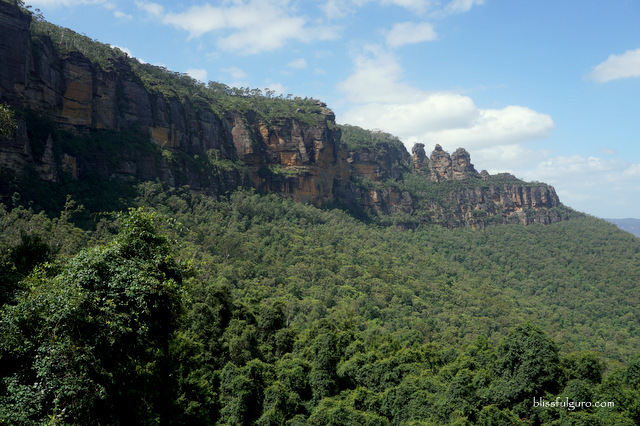 Scenic World Blue Mountains Australia offers a number of breathtaking rides and walkways that capture the stunning views of one of the best national parks in the country. I had the e-voucher from Klook with me (we all love paperless transactions, right?) 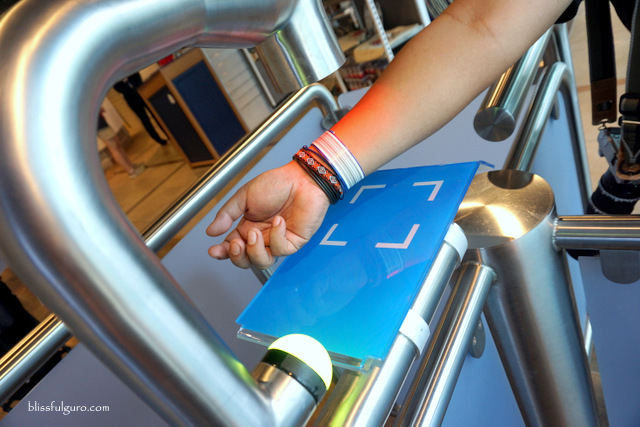 so all we needed to do was to go straight to the dedicated counter (skipping the long queue of walk-in guests) and get our bar-coded wristbands, that easy and fast. We were then given a map on the possible color-coded rides and walkways to take and so we planned our route. We first took the yellow ride or the Scenic Skyway. Suspended 270 meters above a deep ravine, the 720-meter journey on an electro-glass cabin provided breathtaking views of the rainforest canopy. 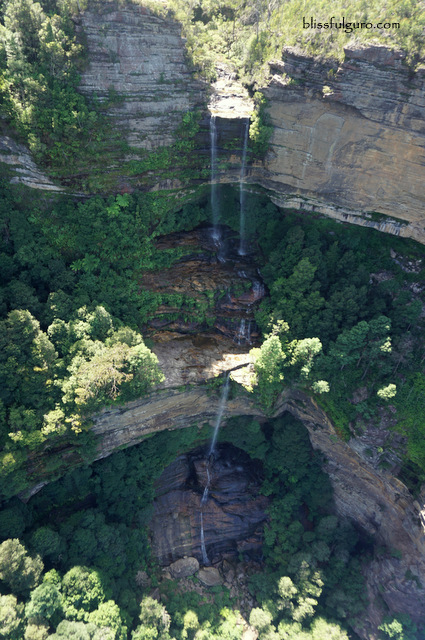 We also saw, finally, Katoomba Falls in all its greatness. Too bad it wasn’t rainy season so there’s not much water. We had to queue again for a ride back to the main hub. 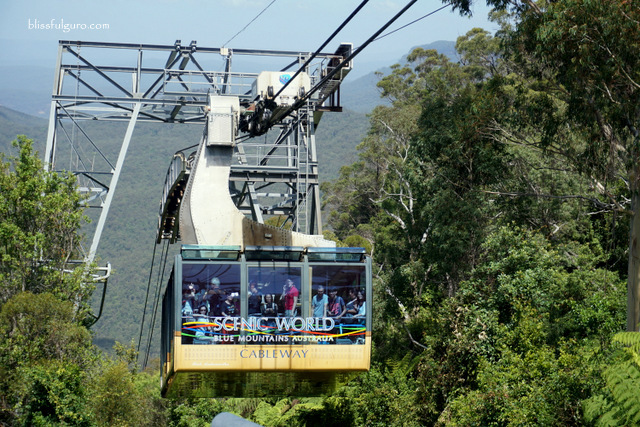 Next was the 510-meter journey on the blue ride or the Scenic Cableway—the largest aerial cable car in the Southern Hemisphere. 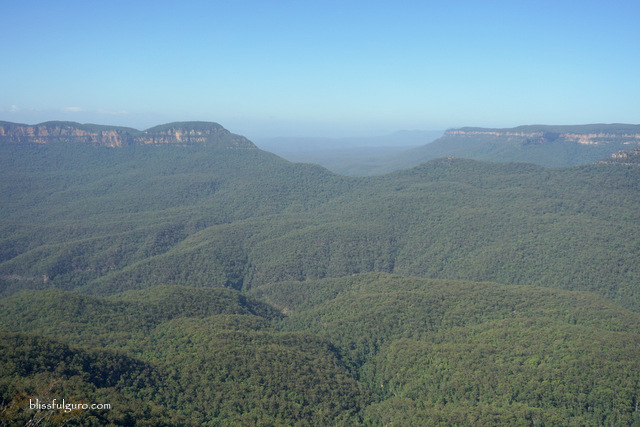 We descended on Jamison Valley and had a panoramic view of the rainforest and the famed icons of Blue Mountains. 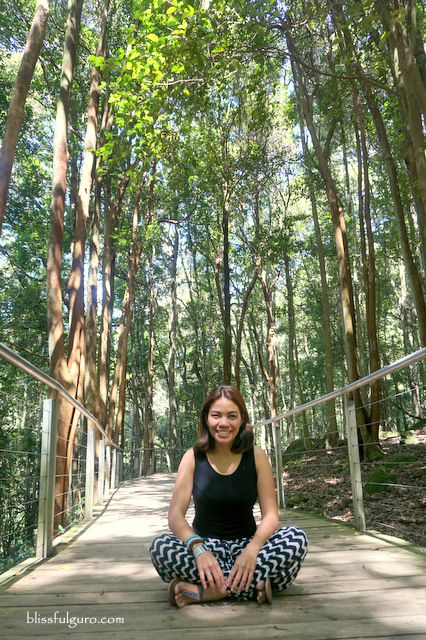 After which, we took a relaxed hike on the green trail or the Scenic Walkway. The ancient forest is a 2.4-kilometer path with an elevated boardwalk. There’s calmness and serenity as we listen to humming birds and ambient sound of swaying trees. Informative labels on the rich flora and fauna of the rainforest can also be found along the way as well which were quite interesting. The last, and definitely our favorite, was the red ride or the Scenic Railway (operating since 1945 but was redeveloped in 2013). 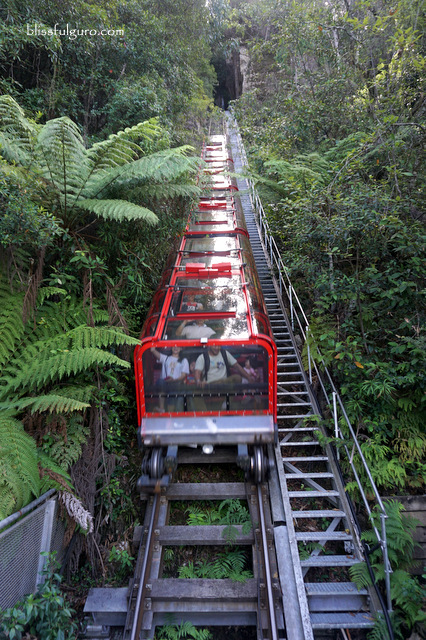 The glass-roofed carriages go into a 52-degree incline which is the steepest passenger railway in the world. 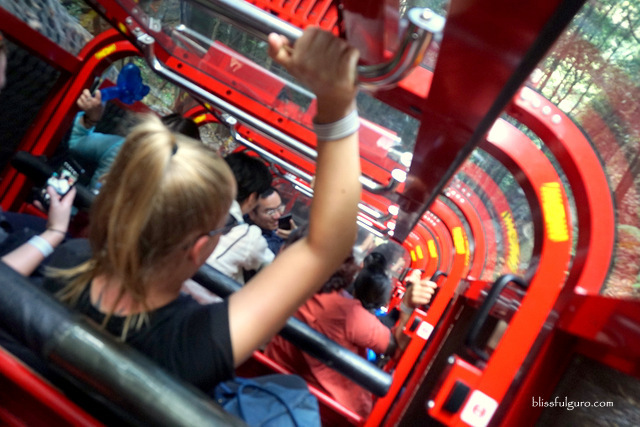 There are three different levels of adjusting the seating position on this 310-meter ride through a cliff-side tunnel with rainforest canopy—definitely breathtaking. We even chose to be seated in front on the way back so imagine the thrill of suspended moving backwards. Scenic Railway-our ultimate favorite ride! We ended the day with a walk back to the train station. It was a quiet afternoon walk to this quiet neighborhood. 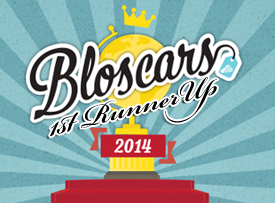 No loud music or flashy bars, just chill cafés and specialty shops around. We wanted to lounge a bit to have coffee or probably one-bottle-of-beer session but we needed to go back to Sydney. Australia is truly gifted with natural wonders that shouldn’t be missed. At first, I was sceptic to whether push through with the trip or not ‘coz I’m really not into mountains and stuff. Good thing though was that my buddy insisted on it which, in the end, proved to be a worthwhile activity. 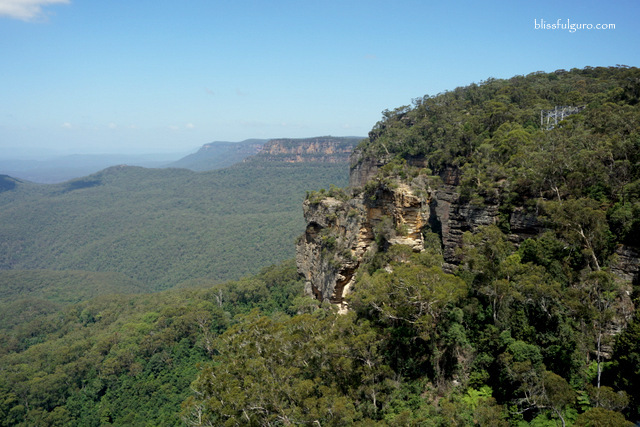 A trip to the UNESCO World Heritage Area of Greater Blue Mountains is definitely the perfect side trip from Sydney.